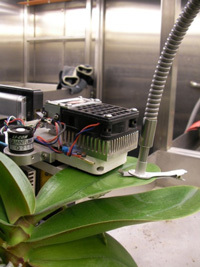 The Laboratory of Plant Ecology is specialized in measuring plant responses and their environment, enabling fast plant stress detection. As official service provider, we offer services and consultancy for sensor installation, calibration and data interpretation. We also provide custom measurement campaigns to answer all your plant related questions. For more information contact: Kathy.Steppe@UGent.be. 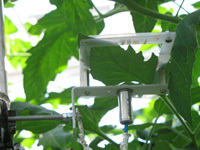 Sap flow sensors are used to quantify whole plant-water use and dynamic plant water transport in trees and crops. 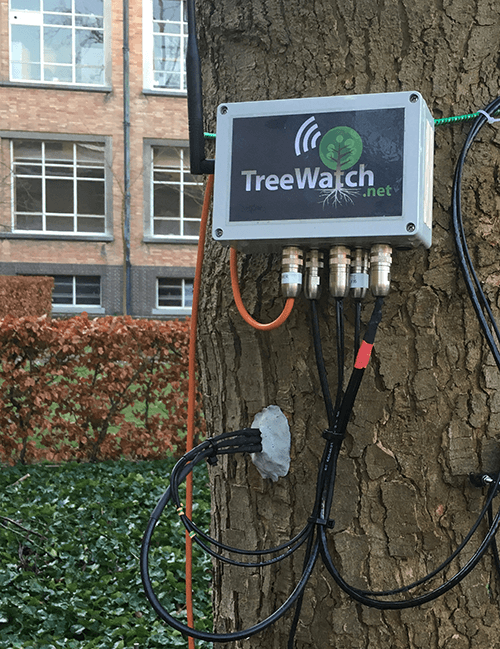 They are also part of the TreeWatch.net technology. 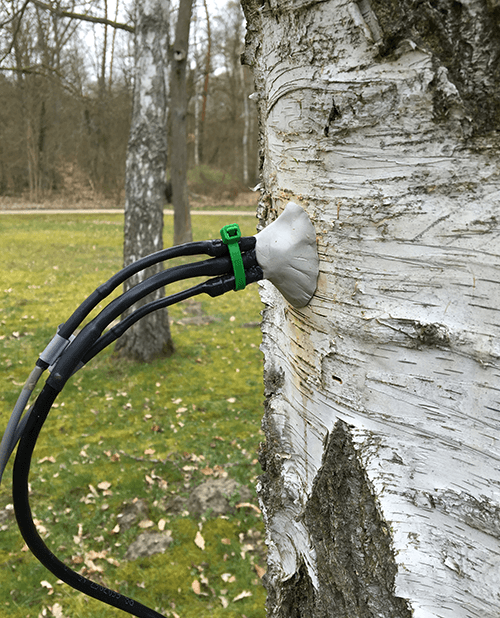 Miniature versions of some of these sap flow sensors are 3D-printed in the lab. We use different types of point dendrometers, including linear variable displacement transducers (LVDTs) and linear motion potentiometers (LMP). 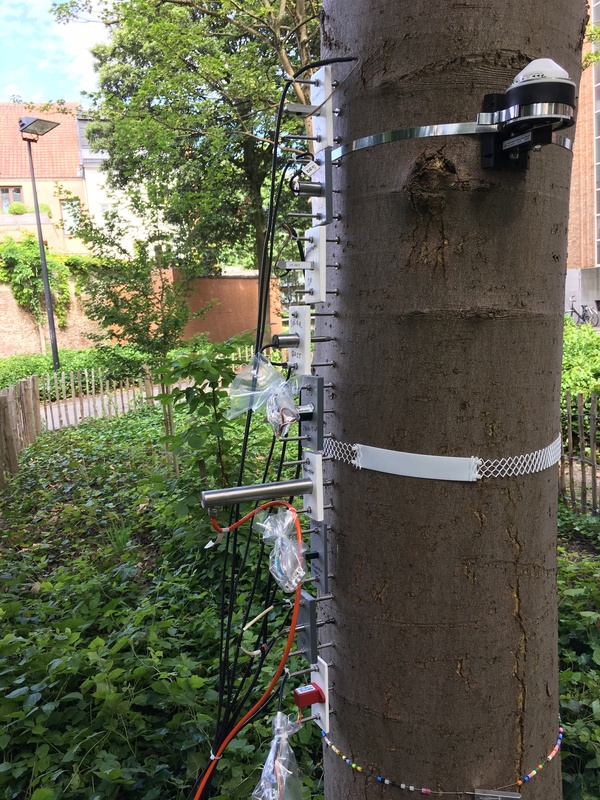 With these sensors, we record variations in stem diameter of trees and crops at high temporal resolution. 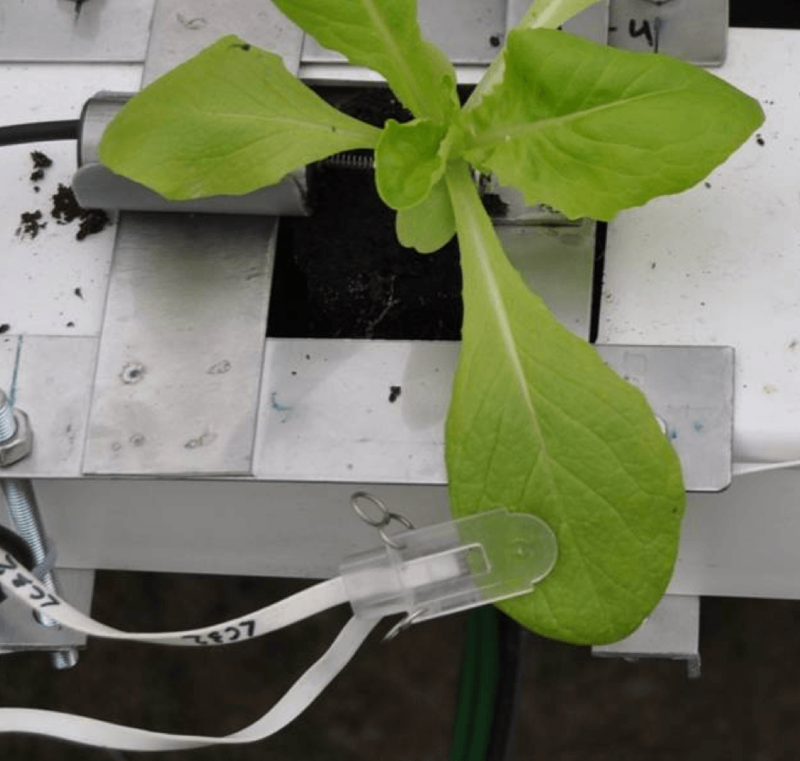 These sensors measure daily shrinkage/swelling and radial growth of the stem, and are successfully used to detect unfavourable growth conditions. 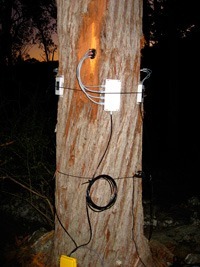 The point dendrometer is part of the TreeWatch.net technology. 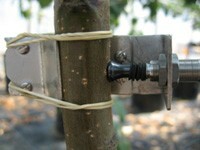 Point dendrometers are also used to measure changes in fruit diameter, which mainly reflects fruit growth, but can indicate water backflow from fruits under conditions of high transpiration or low root water availability. 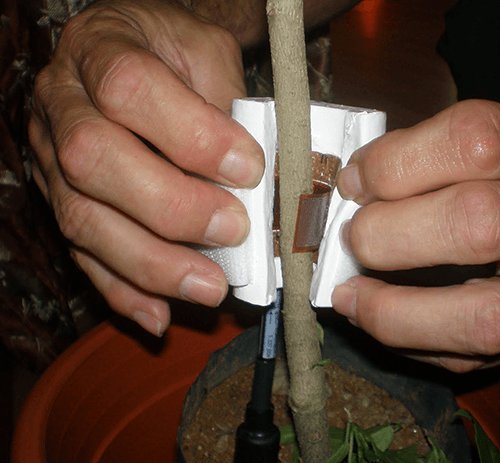 We use leaf clips to measure variations in leaf thickness or variations in dimension when clipped onto other plant organs with small enough dimensions to fit into the measurement range of the clip. The clip output shows the plant response to environmental changes (e.g., irrigation, lighting, temperature changes) and is also useful for plant stress detection (e.g., drought, diseases). 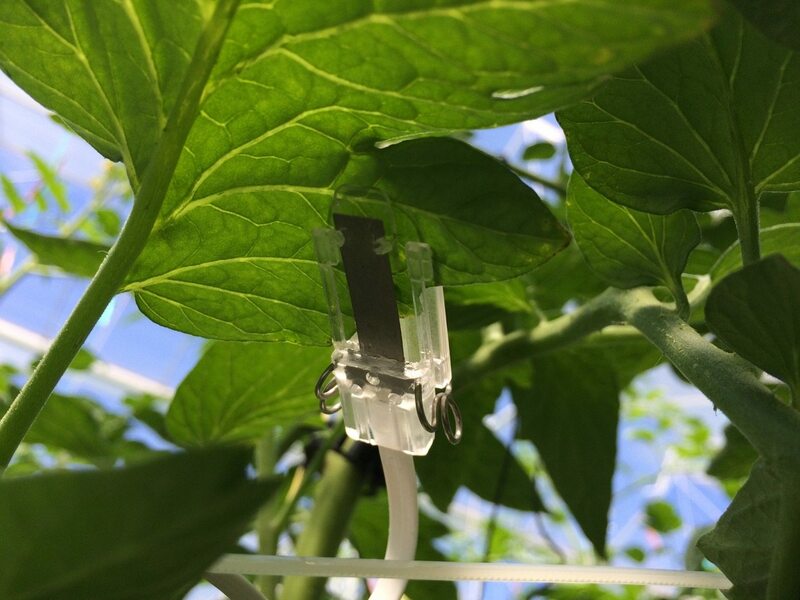 We use contactless infrared thermocouples to measure leaf temperature and, when compared to air temperature, it is used to predict the health status and transpiration activity of the plant. 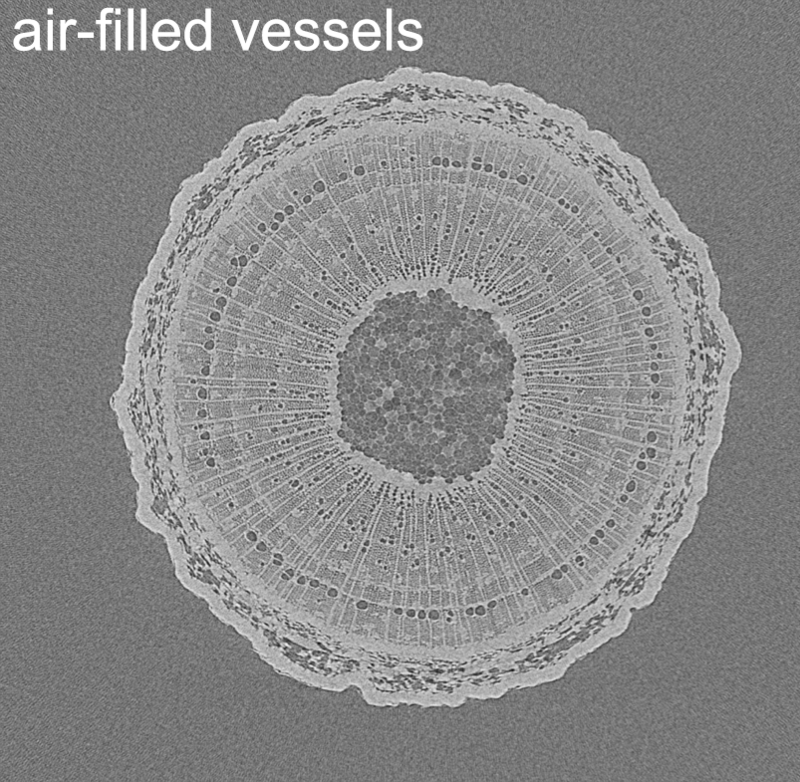 Acoustic emissions are linked to cavitation events, when gas nanobubbles expand and form embolisms, typically triggered by high xylem water tensions. 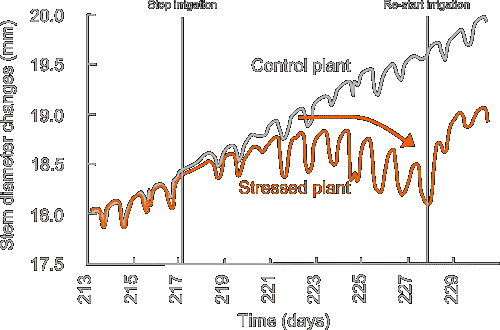 We use continuous measurements of acoustic emissions and radial diameter shrinkage to assess a plant’s vulnerability to drought-induced cavitation. 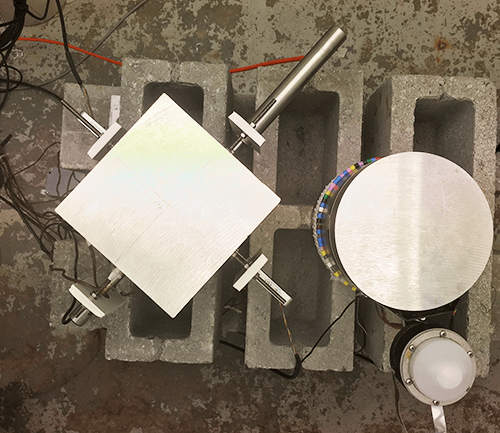 In lab conditions, these measurements are used to develop vulnerability curves; in the field, they are used to estimate relative changes in hydraulic functioning. In addition, we quantify changes in hydraulic capacitance by establishing desorption curves, or by a combination of water content and water potential measurements. 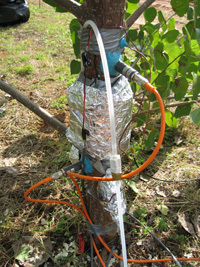 Fan-stirred branch bags/cuvettes connected to infrared gas analysers (IRGA) measure continuously the dynamics in leaf photosynthesis and respiration as well as leaf transpiration. The portable LI-6400XT photosynthesis system is used to measure light response curves, temperature response curves and CO2 response curves. This system is also used to measure actual and saturated photosynthesis rates, transpiration rates, stomatal conductance and water use efficiencies. Stem CO2 efflux to the atmosphere is measured with fan-stirred cylindrical cuvettes that completely surround the stem. CO2 concentration differences between in and outgoing cuvette air is measured with an infrared gas analyser (IRGA). 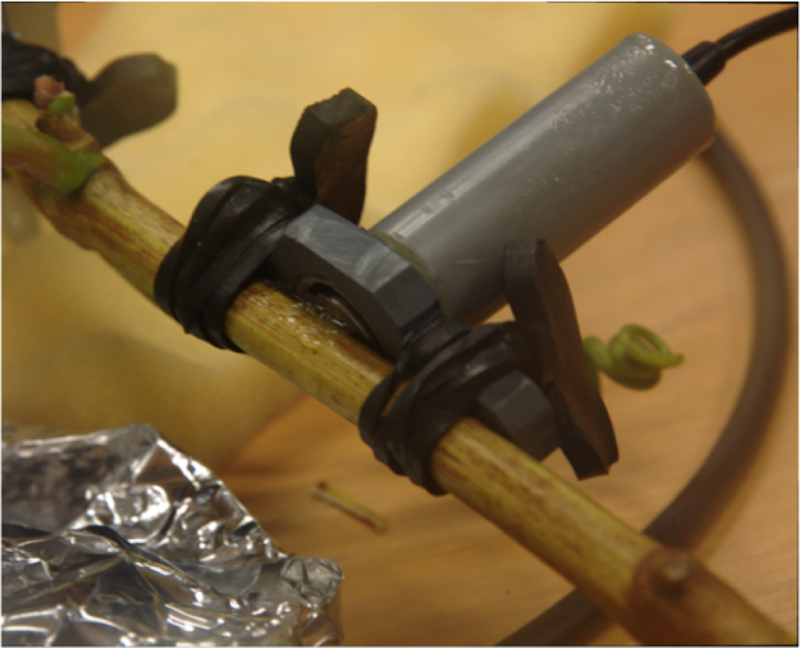 The cuvette is covered with aluminium foil to prevent woody tissue photosynthesis. Carbon dioxide concentration in the stem xylem is measured with CO2 microelectrodes or solid state non-dispersive infrared (NDIR) CO2 probes. Stem respiration is estimated using a mass balance approach that accounts for both outward and internal fluxes of CO2. To measure all parameters related to chlorophyll fluorescence. 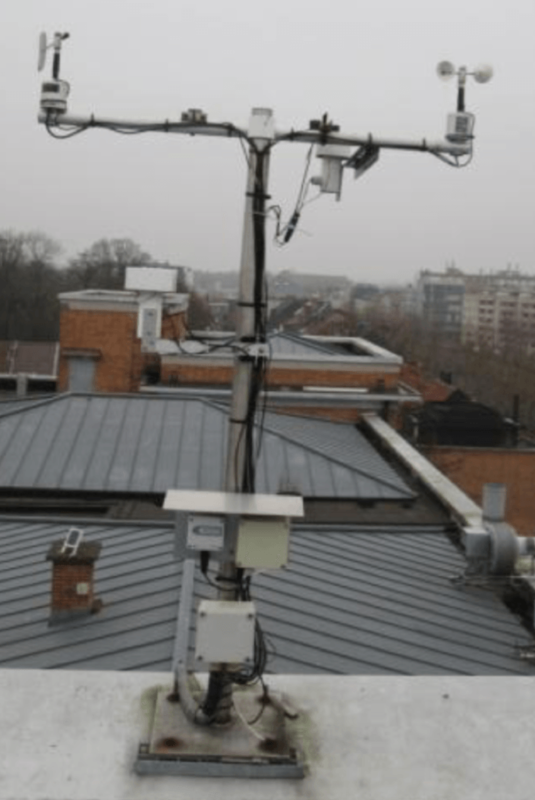 Meteorological sensors are used to characterize the plant’s environment, and to quantify the dynamic changes in microclimate. Meteorological data also helps us understand the dynamic nature of weather phenomena that continually influence plant functioning. In addition, ambient CO2 concentration, rainfall and wind speed/wind direction are measured. Using the meteorological data of the weather station installed on top of the roof of the Faculty of Bioscience Engineering, Ghent University, the Laboratory of Plant Ecology developed the www.ugentweeronline.be website, where people from Ghent and surroundings can follow live the weather dynamics in Ghent city centre. 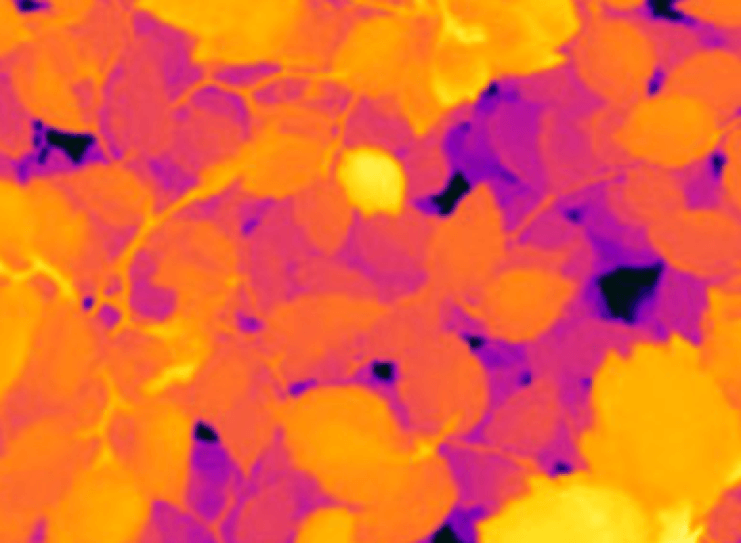 Thermal imaging is used to quantify the spatial variability of plant responses in the field. To this end, our thermal camera (FLIR SC305) is installed on a robotic pan-tilt system mounted on a 7 m tall tripod, or on an unmanned aerial vehicle (UAV, drone). 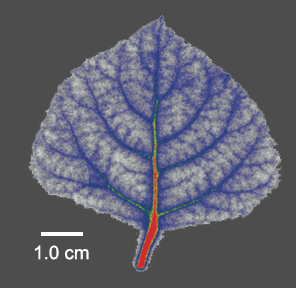 Thermal imaging is also used at leaf-scale to quantify leaf temperature, to estimate transpiration and stomatal conductance, and to detect infections. 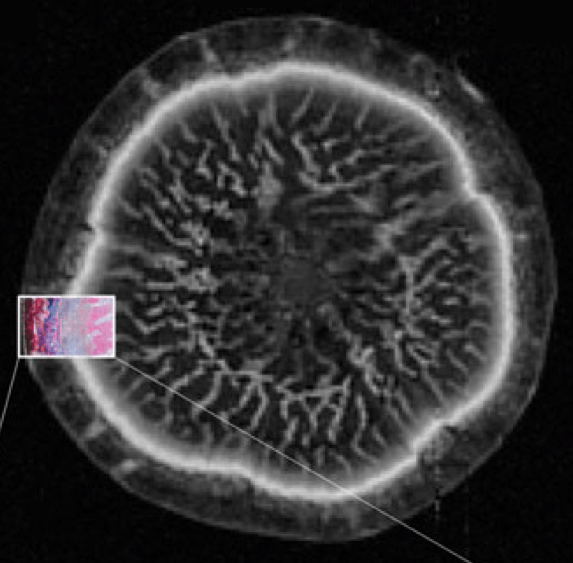 We use X-ray computed microtomography (micro-CT) for non-invasive determination of wood anatomical characteristics, and for non-invasive measurement of vulnerability to drought-induced cavitation. 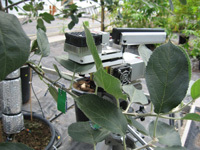 The stems of potted plants are scanned in cutting-edge scanners at high resolution to visualize structure and quantify the loss of hydraulic function at increasing levels of drought. Our micro-CT work is done in collaboration with UGCT. 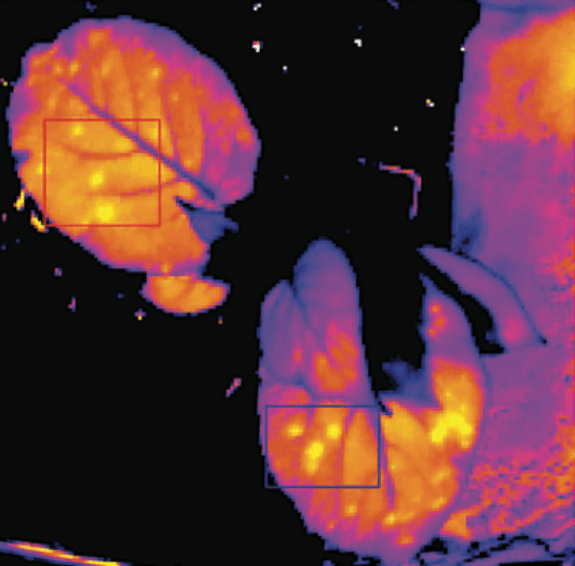 We use positron emission tomography (plant-PET) as a powerful functional imaging technique to decipher in vivo how sugar flow is coordinated and quantify phloem transport in intact plants, both under present and future climate regimes. In addition, we use positron autoradiograms to show the distribution of the 11CO2 label. We work with gaseous 11CO2 label to study phloem loading and carbon distribution. 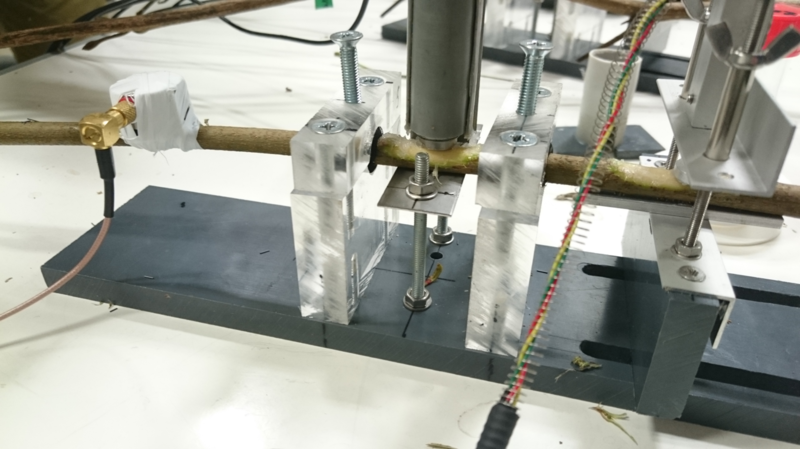 We also work with 11CO2 label administered via the petiole to better understand the fate of xylem-transported CO2. Our plant-PET work is done in collaboration with UGent’s Infinity lab. We use magnetic resonance imaging (MRI) to estimate the amount and quantify the distribution and transport of water in plant organs. This imaging technique can also be used in conjunction with PET where it provides structure-related information to assist the PET-data. Our MRI-work is done in collaboration with UGent’s Infinity lab, and the Forschungszentrum Jülich.